Dhol player Sunny Jain and his band, Red Baraat, gather their friends to bring electrifying South Asian sounds to the Bandshell. with KARSH KALE SOUNDSYSTEM | DJ REKHA | AJNA DANCE | HEEMS | BHI BHIMAN | FALU | and more! The fiery dhol player and frontman SUNNY JAIN brings together his friends and fellow musical travelers for a night of contemporary South Asian sounds. “Mela” is a Sanskrit word meaning “a gathering” or “festival” — a festive, communal vibe will prevail. 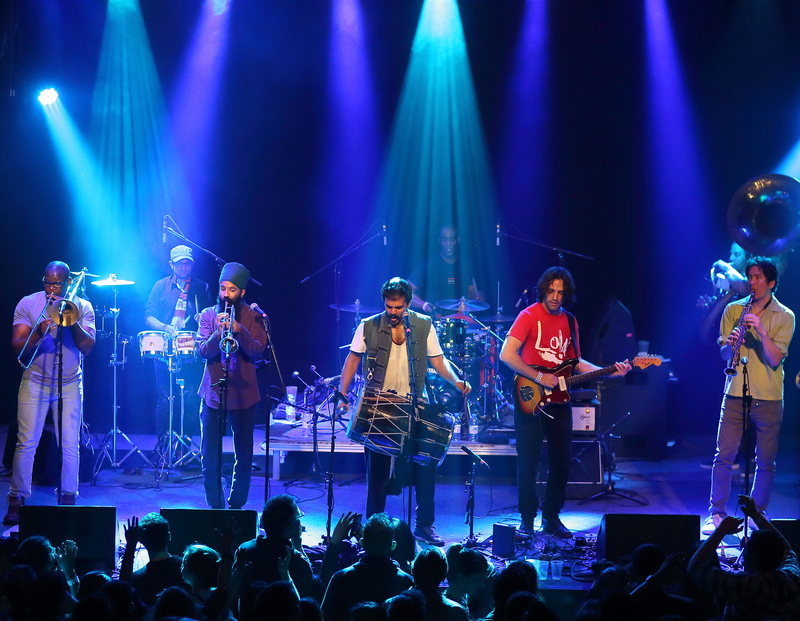 Jain’s Brooklyn-based band RED BARAAT “plays rollicking funk music steeped in Northern India’s wedding celebrations, with a dash of D.C. go-go beats and hip-hop,” (NPR), merging hard driving North Indian Bhangra with other equally danceable musical traditions. KARSH KALE, a pioneering producer and musician who fearlessly explores the worlds of electronica, Indian classical music, rock, jazz fusion, and hip hop, returns to the Bandshell for the first time since performing his remarkable original live score to Enter the Dragon, a BRIC Celebrate Brooklyn! Festival commission. DJ REKHA, a producer, curator, musician, and activist, has been at the center of South Asian music and culture in NYC for two decades: her Basement Bhangra party is about to celebrate its 20th year of existence. One of Rekha’s two DJ sets will include AJNA DANCE, an NYC-based company specializing in both contemporary and classical Indian forms. HEEMS, an MC from Queens, first came to prominence with the underground hip-hop group Das Racist; he has since released several mix tapes as a solo artist on his own label, Greedhead Music. BHI BHIMAN is a San Francisco based singer-songwriter of Sri Lankan heritage (he is named after a character in the Mahabharata). His most recent record is last year’s Rhythm and Reason (Boocoo Music / Thirty Tigers). SHILPA RAY is a wailing, fire breathing Cyclops. She tornadoes everything in her path: small towns, big cities, and children’s dreams. Armed with an incomparable voice and a harmonium haunted by the ghosts of dead lovers, she's been a presence in the netherworld of the NYC music scene for more than a decade, first fronting the gothic Sturm und Drang of Beat The Devil and moving forward to the blues erosion of Shilpa Ray and The Happy Hookers. Her most recent album is Last Year's Savage, which came out in 2015 on Northern Spy Records. DJ Rekha’s Basement Bhangra afterparty at The Bell House: 11:00PM.